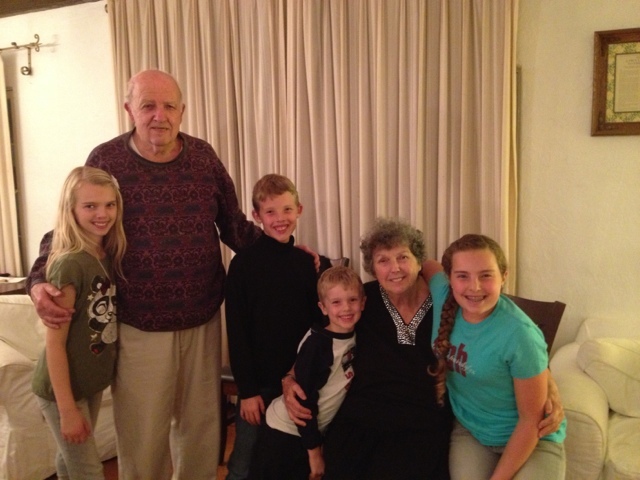 Before I jump into 2013, I thought I'd take a moment to record a little bit about our family's Christmas. It's been a wonderful month. We kept the gifts and celebrations very simple this year and did our best to focus on the purpose of the season--remembering the Lord, giving to others, and cherishing our time together as a family. Eric and I realized that we only have FIVE more Christmases with all of our children at home. Then Alia will be off to college, and our home is going to be empty before we know it. 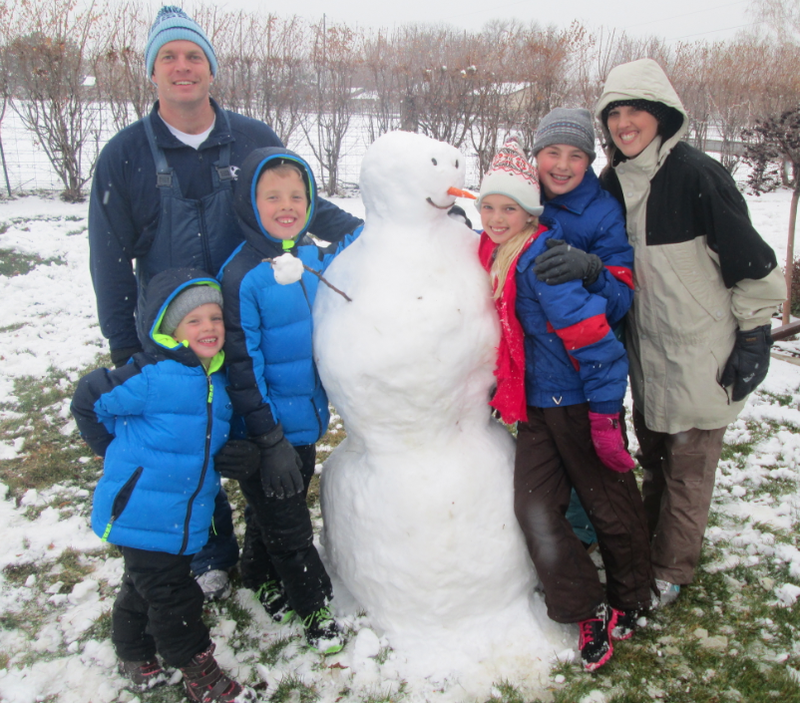 We were so grateful that this year we got to visit Eric's side of the family and my sister's family for a few days and play in the snow--which was a totally new experience for my little California kids. We didn't even own jackets before this trip, and my two boys had never once touched real snow (they are in LOVE with it now). With the help of my mother-in-law, some nice neighbors, and a trip to Target, we got everyone geared up for the freezing weather. This is our very first Perry Family Snowman. Yay! After about a week's worth of travels, we came back to California and had the chance to spend some time with my cute parents (I wrote a little more about this in my Power of Moms post, Your Influence Matters). I just love them. 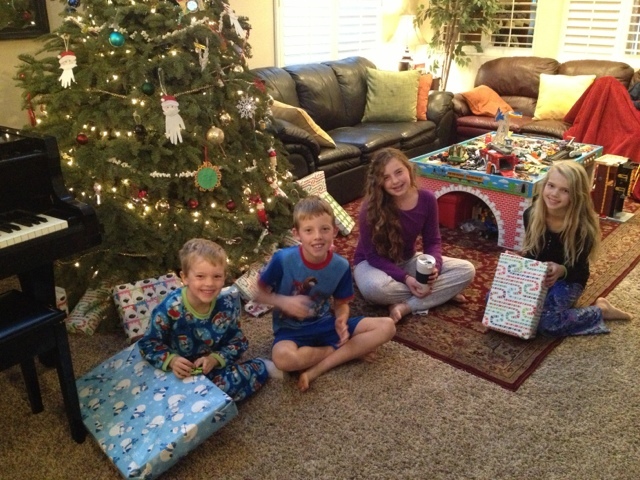 And then we stayed home for the next few days and spent a quiet Christmas with our children. We opened a few gifts, did puzzles, played games, read stories, went on hikes, and just enjoyed being together. There have been a lot of other little details, decisions, and frustrations going on behind the scenes (I just don't have pictures of those and can't describe them here! ), but I'm grateful for the moments of beauty that have been weaved in between. I think of these precious memories as "tender mercies" from the Lord. 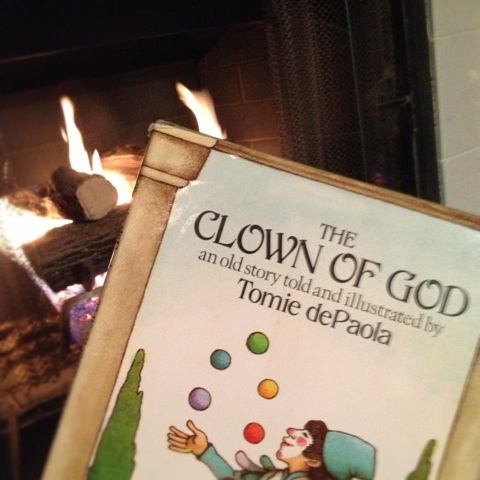 One of my very favorite experiences from this Christmas was reading "The Clown of God" by Tomie dePaola to my children. Have you heard of it? My mom read it to me when I was a teenager, and now I read it to my children every year. 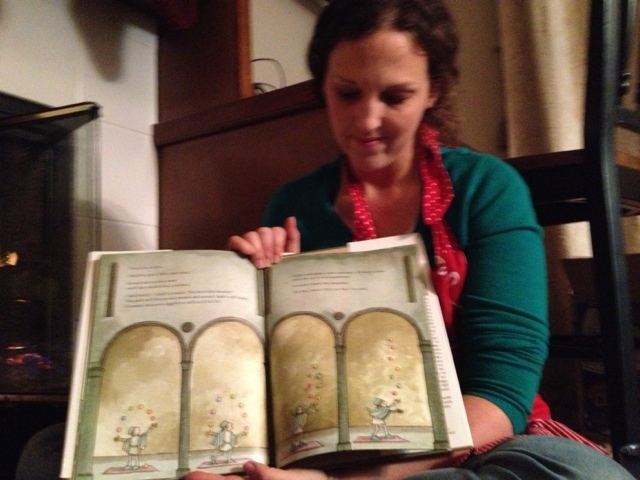 Alia snapped this picture with my phone when I was reading to them by our fireplace. The basic story is that there is a young orphan who learns to juggle as a way to earn his food for each day. He can juggle all kinds of things--plates, sticks, etc., but his best act is juggling a rainbow of balls (pictured above). He adds red, orange, yellow, green. . . and finally ends with a large golden ball called "the sun in the heavens." After traveling for years with a group of actors, he grows very old, and no one wants to see his juggling act anymore. Depressed, hungry, and worn down, he returns to the place he was born and finds a dry corner of an old church where he falls asleep. But that night is the "Procession of the Gifts," and he watches as a line of people come into the church to give gifts to the Christ Child. After everyone leaves, the poor juggler wishes that he had something to give the Child, as well. Then he remembers a conversation he once had with two monks, who told him that every time he makes someone happy, he is glorifying God. So the juggler gets out his rainbow of balls and his mat and juggles the very best juggling act of his life. When he gets to the finale with "the sun in the heavens," he is filled with love for Christ, and before his heart stops and his life comes to a sudden end, he calls out with all his energy, "For you, sweet child, for you!" That's the part where my mom always got choked up. Because that's how she lives. She does her best every single day to make other people happy and to glorify God . . . even when her work is humble . . . or challenging . . . or frustrating. And sometimes when I find myself up to my elbows in laundry, handling a difficult situation with one of my children, or struggling to get through a stressful moment, I think of this story, and I say in my mind, For You, Sweet Child, for You! Eric and I have high hopes of really making a difference to others. We want to take our children to do service in third-world countries. We'd love to do more humanitarian work right here in our own area. We've talked about adopting a child or two someday (my girls are begging for a sister). Right now I feel pretty maxed out, and caring for our home and four children (and running Power of Moms) is a lot for me. But this book, The Clown of God, and the sweet experiences and feelings of this Christmas season have helped me to see that my offering to God--however meager and simple--is accepted by Him, the One who knows each of our hearts. And these thoughts are what help me "keep Christmas" all year. 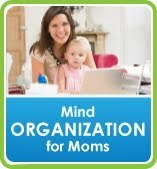 I am going to order that book for myself and for my mother-in-law! She LOVES Christmas books. Thank you for sharing that tradition! 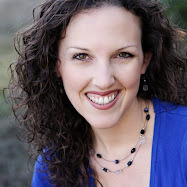 You are already making such a difference through The Power of Moms, April. It has really blessed my life, and I know that is true for thousands of moms around the world. Thank you! Thank you for always giving me so much to think about! Sorry this comment is so long! Rachel, I really appreciated your comment. Thanks for the information about the Hogar Project. That looks phenomenal. I'm putting that into my "Someday" list. And I LOVE that post "Rage Against the Minivan." It's wonderful. Can't wait to meet you in person! Thanks Carrie! And yes--Jake IS my brother-in-law! What a small world. Thanks for your kind words. Hope we can meet in person someday!